DEX 3 is professional DJ Software for MAC and Windows that allows you to seamlessly mix music, music videos and host karaoke shows. DEX 3 gives you full control over your media, allowing for more creative freedom while mixing than ever before. With our beat-grid based automatic beat mixing and key detection it’s easy to blend tracks, allowing you to focus on the other aspects of your mix. Since DEX 3 offers no-latency playback and support for today’s hottest DJ controllers; loops, hot cues, and all playback features are ultra-responsive. Mix with DEX 3 using just a keyboard or mouse, or use one of the 75+ supported DJ controllers for tactile hands-on control. Download DEX 3 today and cue up your imagination – DEX 3 is the complete DJ mixing software solution. The included library filters allow you to view only the file type you want to work with, and the fast search feature displays results as you type. Create custom playlists or generate lists from directories on your hard drive. Album art and color coding makes it easy to find the song/s you’re looking for. New “List Mode” allows for a more traditional column-style layout. Playlist playback automation is built right in; engage Automix or Shuffle Play if you need a break. PCDJ has teamed up with The Video Pool to offer DEX 3 users high-quality MP4 music videos for video mixing DJs and VJs. The Video Pool subscription service has various subscription tiers and offers a wide selection of hip hop, R&B, dance, rock, 90s, old school, pop, reggae, blends, mashups, and premium DJ video remixes for the urban and club DJs/VJ’s. Purchase and download DEX now and receive free updates! Note: The above are recommendations for standard 480p Video file Mixing. DJ Controllers provide hands-on tactile control over DEX 3, allowing for more creativity while mixing. Over 75 DJ controllers from popular DJ equipment manufacturers are natively supported, which means zero-configuration required so you can get into the mix right away. 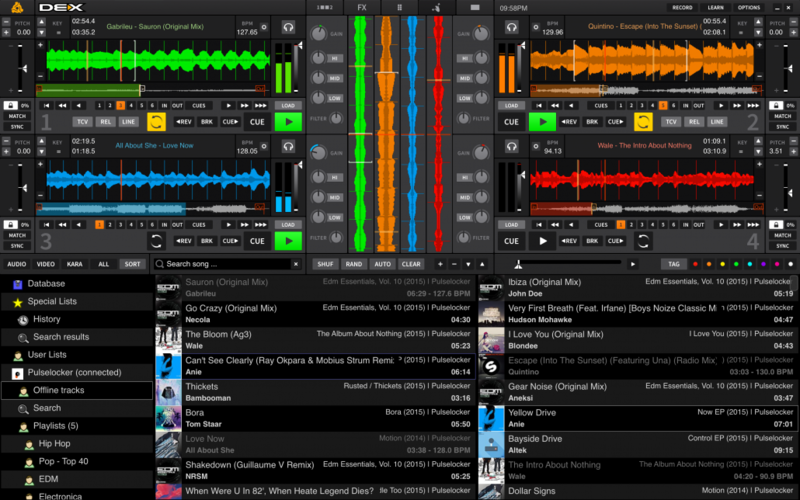 Use multiple DJ controllers at once — DEX 3 will even detect when a controller is connected in real-time.